According to the Supreme Court, the federal government violated Omar Khadr’s constitutional rights and that Khadr’s rights continue to be violated. Nevertheless, the court refuses to order the government to do the right thing — seek Khadr’s repatriation from the Guantanamo hell-hole that he has lived in for the past 7 years. 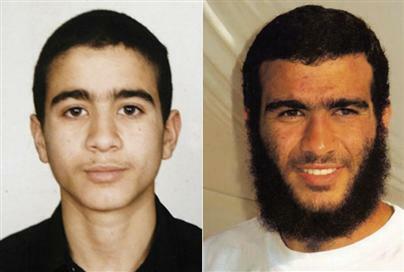 Photos of Omar Khadr as a teenager, left, and as an adult, right. Khadr has been jailed for the last seven years in Guantanamo Bay, Cuba. Photos: National Post. The conduct of Canadian officials “establishes Canadian participation in state conduct that violates the principles of fundamental justice,” said the court. “Interrogation of a youth, to elicit statements about the most serious criminal charges while detained in these conditions and without access to counsel, and while knowing hat the fruits of the interrogations would be shared with the U.S. prosecutors, offends the most basic Canadian standards about the treatment of detained youth suspects,” says the judgment. The court said theses acts violated section 7 of the Charter of Rights – the right to life, liberty and security of the person. And it said the violation of Khadr’s rights is still ongoing. The Supreme Court does not believe it has the legal right to intervene in foreign affairs, even when an intervention would force the federal government to defend our constitutional rights. That is not only Omar Khadr’s loss; it is our loss, as well. It empowers and emboldens Harper and all future enemies of freedom who end up living at 21 Sussex Dr. to continue to attack human rights. The Khadr case demonstrates the limitations of our legal system. It also makes it clear that, ultimately, justice is a political problem that demands a political remedy.